Isla Holbox! 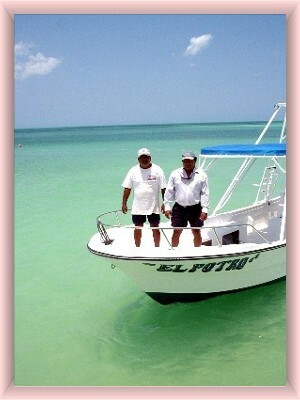 Welcome to Holbox fishing information page! Fishing has long been a way of life here on Isla Holbox. You too can enjoy a variety of types of fishing. Isla Holbox offers the fisherman an opportunity to catch a variety of different fish. Small boats with your own Capitan/mate leave daily in the early morning hours. 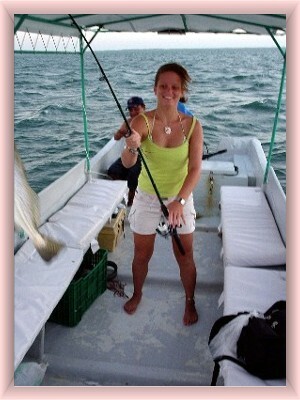 Isla Holbox Fun Fishing spot for all!! 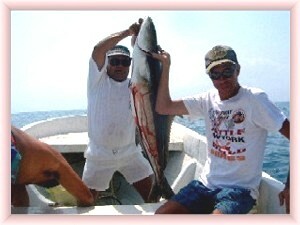 Bottom fishing, deep sea fishing and even some fly fishing is available from the island of Holbox. Daily boat trips for 4 hours for max of 5 people are available. After a day's fishing, eat your catch at any of the local restaurants. Willy and Chino, our two expert fishing staff Fishing for all ages, children and elders can be done here on Holbox island. Bob and Capt. Willie with the Big One! With captain Willie, you can do bottom fishing, close by or far away. Boats departure early in the morning and head out to catch any variety of species swimming in the near by waters. 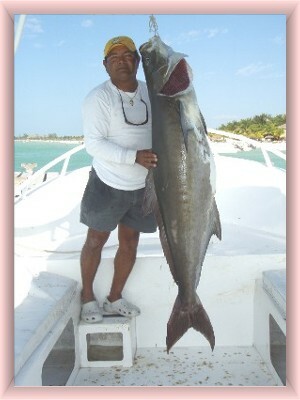 Capt.Willy with 45 kilo Esmedregal!! Fishing is done with line and your hands, Bring your poles if you prefer to use one!! Boats can take a max of 5 people and prices range pending on the distance from shore and length of time you wish to fish as well as the boat you choose to fish from, price ranges depend on size of boat and location you are fishing at. 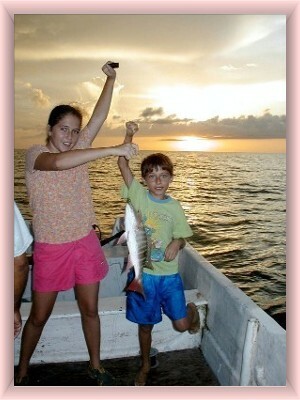 Isla Holbox is an ideal place for children to learn to enjoy the wonderful sport of fishing..
Tatiana and Zak with their fish! A wonderful Isla Holbox fishing trip is waiting for YOU! Hope to hear from you soon, Friend!! Isla Holbox await your visit!! Learn all about types of fishing at fishingline.net.